I thought I knew myself pretty well, but it turns out I'm a mild laclabphile and never realized it. 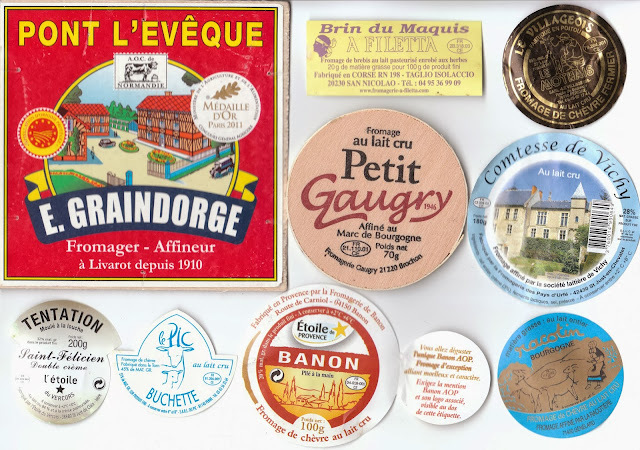 That is to say, I like to collect cheese labels, though in my case it's really only the ones that are a) recent and b) easy to clean, and I do it mostly to help me keep track of information for the myriad of cheeses I'm tasting this year. My husband tolerates this latest collection of mine mostly because it takes up so little space. And because he gets to eat the cheeses that come with them. Interestingly, the French do not seem to have a translation for the word laclabphily. Rather, they use the word "tyrosémiophilie", which has a specific translation in English as "tyrosemiophily" and means -- in English -- the collecting of Camembert labels, specifically. In French, it appears to mean both, though most people here simply collect the Camembert labels anyway. Well, most people who collect labels, that is. Given that the words barely show up in dictionaries, it can't be all that common. I don't have a single Camembert label, so I can't properly call myself a tyrosemiophile, which is good since I can't seem to remember the word for more than two seconds. Of course there are clubs, dealers, and shops for collectors. There's also a fantastic website called Camembert-museum for tyrosemiophiles with labels cataloged by theme. I like all this because it makes me feel slightly less nutty for my cheese project in general. I'm not the only cheese fanatic out there! Racotin is a little shot-glass-sized plug of raw goat's milk farmhouse cheese from Burgundy. It can be very young, with two weeks in the caves, and a fine, creamy-colored crust, as in the photo. Or it can be aged further, with more pronounced molds on it. The milk comes from goats that graze in the fields when the weather is nice and are then fed hay in the winter. It's a pretty little cheese -- and a delicious one -- with a snow white interior that has the traditional characteristic of a firmer goat cheese: creamy yet a little dry-crumbly at the same time. Racotin is hard to dislike, as long as you are somebody who appreciates the nuances of farmyard and goat in your cheese. Why Racotin? Because it's one of the labels I am able to clean and save. It's the blue one in the collage above and again, larger, below. 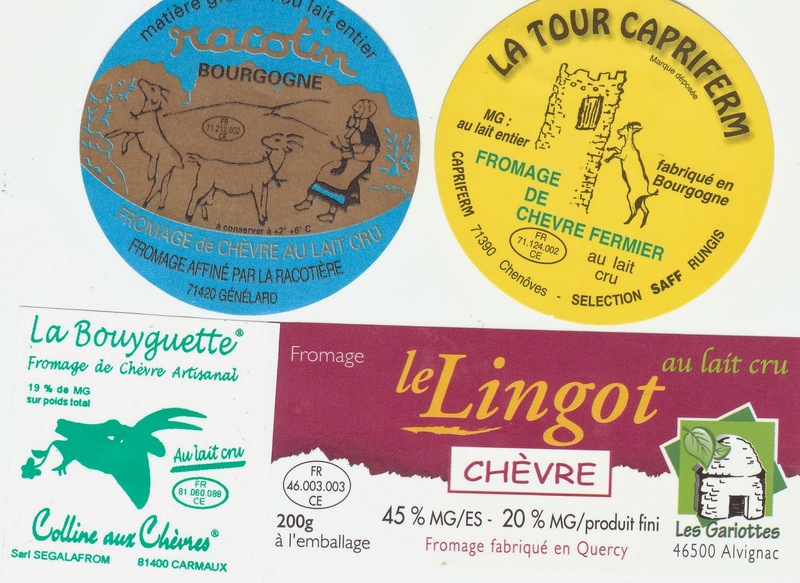 My newest labels -- that didn't make it into the collage above -- are La Tour Capriferm, Le Lingot, and La Bouyguette.